Designer Magazine has always been forward thinking when it comes to new music, whether it's been on our Manchester Unsigned column or one of the many bands we've decided to back when other publications have been too busy powdering their noses with the latest record exec who happens to want a front page feature on the Strokes, The Vines and White Stripes also rans that have plagued the covers of the national music press for the best part of two years now. Last year in an In The City Preview we featured The Darkness, Kinesis, The Raveonettes and The Crimea in a list of 15 bands you should look out for. In the space of the months following ITC three of them have gone on to have Top 40 hits and bands such as Jarcrew and Thoria who we also covered are building up a following through various support slots. 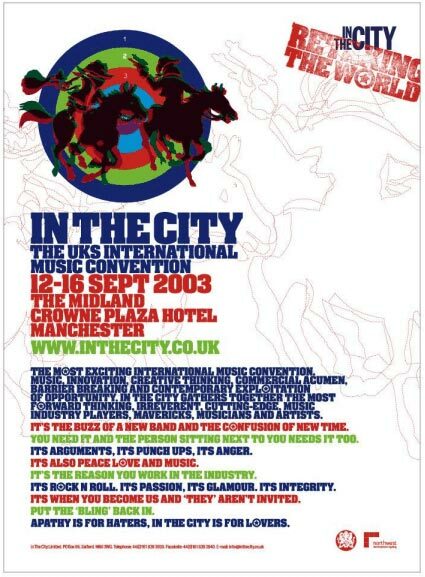 ITC 2003 looks set to get even bigger this year with a 2 day conference in New York (21st / 22nd October) following the annual conference in Manchester between 12th - 16th September. This years theme is "Retaking The World" which is going to take a proactive look at why the music industry is in such a mess and as chief operating officer Rose Marley adds "In The City will be inviting talks with the telecoms industry, the hardware manufacturers, the ad, films and games industry" in order to turn the advent of the internet and different methods of communication into something the music industry can work with rather than fighting against. "ITC Unsigned & ITC Live"
After previous years in the Salford Basin and Castlefield, the Unsigned and Live showcases return to their natural home in the Northern Quarter (home to venues such as the Night & Day and The Roadhouse). It's also going to be the first year the live events are going to be publicized to the general public which will immediately give bands playing a groundswell of support amongst the fans in the city as well as the industry itself. Q:What is the deadline for submitting demos to ITC Unsigned 2003? A: Your demos must arrive at the ITC offices with an application form by 5pm on Friday August 1st. For an application form visit the official ITC Website. Q: Designer Magazine is asking for demos to be sent in for an ITC Unsigned preview. Is the deadline the same as above? A: No, we can accept demos up to and including August 23rd, the date when ITC notifies successful entrants to the competition. Q: Ok we know you're buried in sackfulls of demos right now, but what if our band has been selected for ITC Unsigned or is playing a showcase gig and the demo doesn't arrive by August 23rd? A: In The City of going to let us know which bands have been selected shortly after August 23rd. Once we have the list in our hands we will be emailing every single band on the list and asking them to submit a demo to Designer Magazine. We hope to do the same for fringe events as well so please send demos and info as soon as possible. Q: There must be loads of amazing demos you've been sent that somehow slipped through the net and missed out on ITC Unsigned. What are you going to do with these bands? A: There's a number of bands demos we've already selected that should make the official list...if they don't we'll eat our words...but Designer Magazine will be bringing a best of the rest.